Cons: Randomly loses RAID configuration meaning you lose all data on your drives. Other Thoughts: Works fine just long enough for you to get comfortable trusting your data, and it will fail. Pros: Performance is good. They seem to have updates fairly frequently. It offers many RAID configurations. Cons: Needs high air flow across processor heat sink to keep cool. On their Web site it says: "Note: This Adaptec card contains a powerful RAID processor which requires adequate airflow to operate reliably. 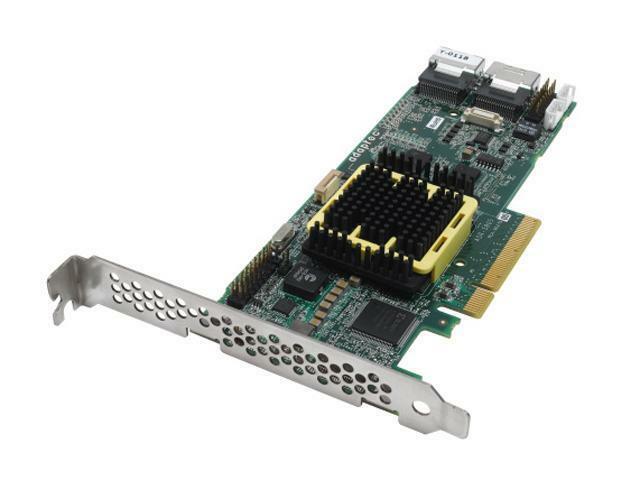 Please install this card only into server or PC chassis with recommended airflow (200 LFM)." The boot time for a home computer is rather long--around one minute or so, so it basically approximately doubles the overall boot time, I found. The drive activity light source on the board does not supply enough current to make the drive light on the computer case bright. I called Adaptec Support about this over a year ago and I was told it was a known issue and they were in no hurry to resolve it. The Adaptec Storage Manager (ASM) software, I think, isn't the most user friendly. Other Thoughts: It's difficult to talk to anyone in Sales and the e-mail I sent today to Sales was returned. I have had a little problem with getting good Technical Support. This controller doesn't come with drive cables. Cons: It uses directional SAS cable connectors. Other Thoughts: I'm re-reviewing this because we finally got the thing working. The problem was the use of the wrong directional SAS to SATA fanout cable. I give SAS cabling technology 0 out of 5 eggs, because it doesn't need to be directional, and even if it did, then the connectors should be male to female like all other modern cables. We'll know more if we get a working replacement. Cons: It will boot, but it will not find any drives. We have tried multiple motherboards and drives with this thing with no luck. We've jumped through a couple days worth of troubleshooting hoops with Adaptec support, and we just want to be done with it. Also the price is high. Other Thoughts: It would be nice to try a replacement to see if this unit is defective or if the model has design flaws that severely limit compatibility. Pros: These cards are very solid. They are fast, support about every RAID level possible. Support up to 256 drives (although I've never found something it can attach to support that). Supports Linux and also VMWare natively which is nice. Adaptec is by far the best RAID card maker IMO. Cons: Management software is good, but a little akward to use. Other Thoughts: Highly recommend updating the card's firmware before use, there has been MANY bugs fixed in this card and supports more motherboards since it's release. If your server isn't start and just blinking, update the firmware will fix it usually. Pros: Small, fast IO, great website and regular driver/BIOS release. I found this perfect to use with SSD's. Great management software and extremely good driver support for almost all operating systems. It has a high end Intel IOP348 dual core processor at 1200MHz with large 512 cache. Cons: Two things which made me drop and egg. It runs very hot... perhaps it was only designed for rack servers with great air flow. Its temp does not interfere with performance, but without active cooling and in a closed workstation case and normal office temp the alarm would go off every few mins. Adaptec should probably consider active cooling or add an active cooler in the box for workstations. Kernel boot time is rather long. For servers it's acceptable but I found it a bit long for workstations. Other Thoughts: We have a 3405 and two 5805. One of 5805's were ordered for a workstation with a few SAS drives and a pair of solid state disks. This controller is great for both type of drives and will not disappoint. If you need a controller with SAS/SATA cables get the other 5805 which is a bit more expensive. This package will give you a card and a low profile PCI bracket.